Barcelona — Antonio Gaudi. 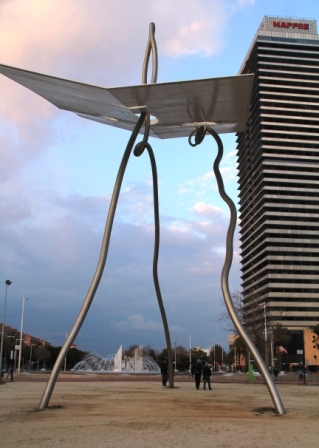 The city’s artistic son, genius architect and builder, has given the Mediterranean port a host of astonishing edifices admired by millions of tourists every year. I was recently one of them. 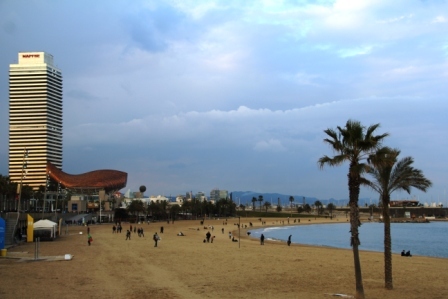 I have been to this energetic city, the capital of Catalonia, one of the richest and most highly industrialized regions of Spain, several times. This time I met friends from the Ski Club of International Journalists (SCIJ) who had spent a week at the ski resort, Baqueria Beret, before coming to Barcelona. You never tire of this city where progress and change are on a rapid march with dazzling new architecture and the renovation of old neighborhoods and old treasures. Exuberance is in the air. This visit focused on both old and new. 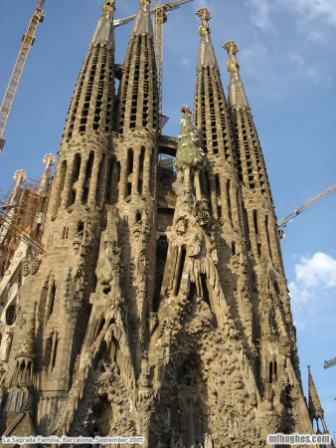 Gaudi’s masterpieces, especially the still-unfinished Sagrada Familia (Holy Family) church, draw most of the 7.4 million visitors to the city of 1.7 million each year. It’s like no other church you’ve ever seen: bizarre, weird, wonderful. Sagrada Familia was the last and greatest work by Gaudi, who died in 1926 in a streetcar accident before the church was finished. Completion is on the agenda for 2026 – 2028. 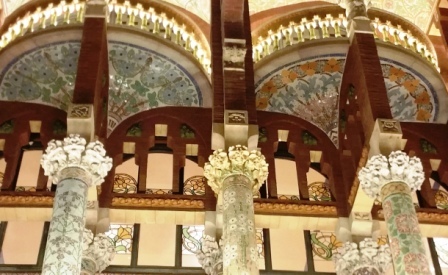 Gaudi’s style was known as modernisme, the Catalan version of Art Nouveau or Jugendstil. It’s a decorative, organic style featuring sinuous curves, stylized creatures, floral motifs with an aversion to straight lines and symmetry. Sagrada Familia reminds me of someone gone mad with Play Dough — a facade of sculpted, molten stone, towers, spires topped with sunbursts, symbolic flora and fauna. Giant pillars rise out of turtles’ backs ending as palm trees topped with fronds. An angel swoops out of a green granite fir tree. Not your typical church. Unfortunately this time the lines were long for an interior visit. We chose not to wait, but I will go back to Barcelona. 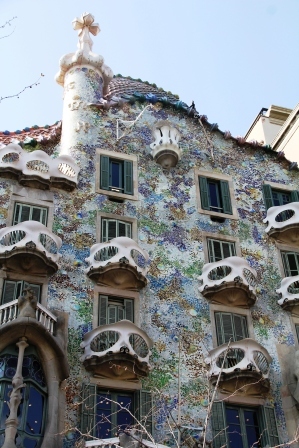 Husband VR/BB and I did visit the Casa Batllo where, thanks to the audio guide that comes with admission, we learned fascinating details, not just about this apartment residence that Gaudi remodeled, but also about him. From the heating system to the swirling décor, from the furniture to the wood work, Gaudi‘s genius mystifies. 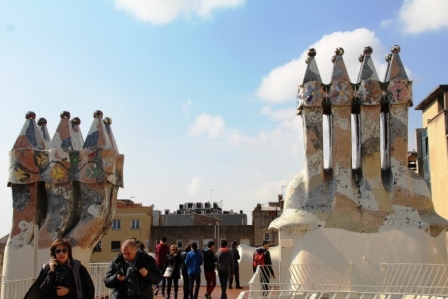 There are numerous theories about Gaudi, an enigma of a man who was very religious and a loner. He gave no interviews and had no close friends. He never married, became a vegetarian and never left Spain. What influenced his wild, exuberant, puzzling style? 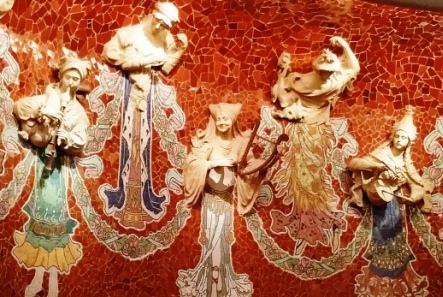 On previous Barcelona visits I marveled at Parc Quell, the Gaudi park that has a Disneyland quality to it with fanciful fairytale gatehouses, a dragon guarding a staircase, a cavern of columns supporting a mosaic ceiling and much more. 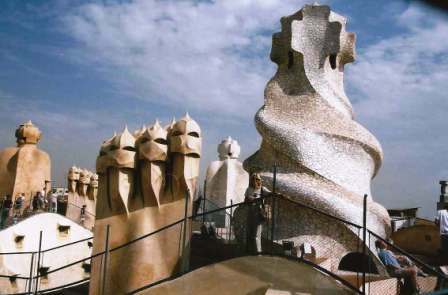 La Pedrera, a revolutionary house Gaudi designed, is another wonder to visit and reveals Gaudi’s engineering talent. It is supported only by columns – no interior load-bearing walls. The roof with its sci-fi chimney pots is a favorite to photograph. several of the structures all connected by underground passageways. More marvels of modernisme – domes, gabled roofs, decorative panels, sculptures, mosaic murals, stained glass. 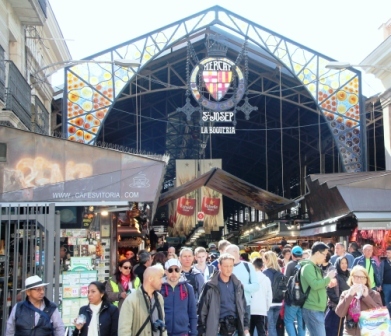 Our visit also included a stroll through the narrow streets and alleys of Barcelona’s Barri Gotic, the Gothic Quarter. Tucked away in this medieval maze are interesting shops and restaurants. The Picasso Museum is deep within the neighborhood, and since there were no lines, although we had visited it on a prior Barcelona trip, we decided it was worth a repeat. I am a Picasso fan. This museum’s comprehensive collection of the artist’s early works is enlightening and illustrates his ever-changing styles. 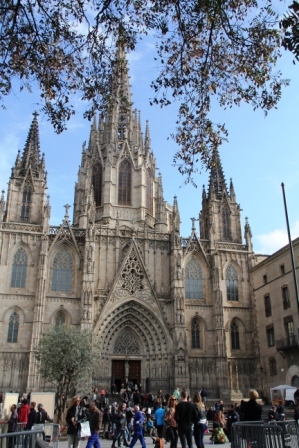 The outstanding Gothic cathedral was another repeat visit. I wanted to see if the gaggle of geese was still at home in its leafy cloister. No doubt different geese, but a few of the big birds still reside there. 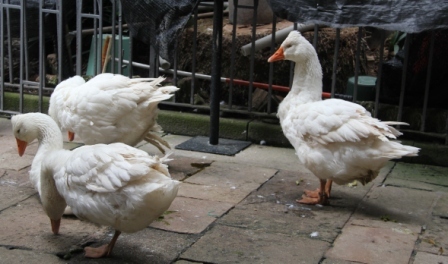 They are said to be descendents of geese originally kept by Roman soldiers to act as sentinels and make a ruckus if intruders approached. 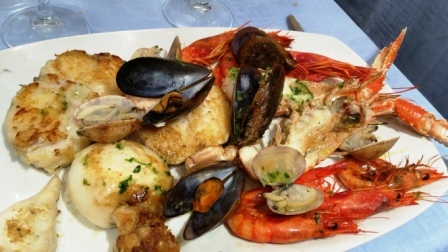 We strolled on Las Ramblas, Barcelona’s Champs Elysees, and ducked into La Boqueria, the city’s famous Market which dates to the 13th century and has unfortunately become a top tourist attraction. Tour buses deposit their passengers at the entrance who then pack the aisles between the gorgeous displays of hams, sausages, fish, etc. and stop to take selfies. Stall owners have been complaining that they block the aisles and drive down business. Serious shoppers can’t get through. 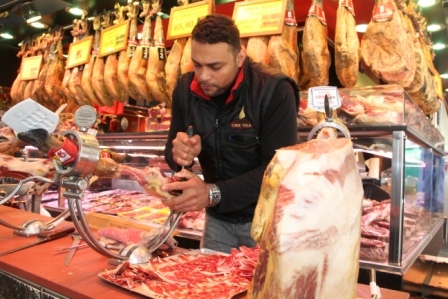 I made the mistake of buying several packages of pricey vacuum packed Iberian ham and sausage there. The contents were very disappointing. They may have been packaged too long ago, or were of inferior quality for dumb tourists. 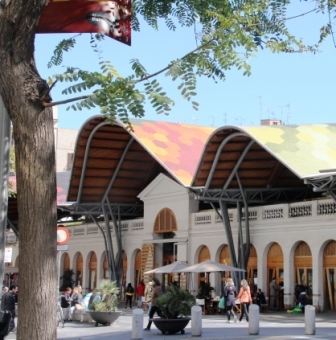 I won’t shop there on my next visit, but instead buy at the Mercat de Santa Caterina, a newer market but with much of the same. And I will return to two super restaurants, finds of my Finnish friend Terttu who has a friend who has written a Barcelona guidebook. Details below. 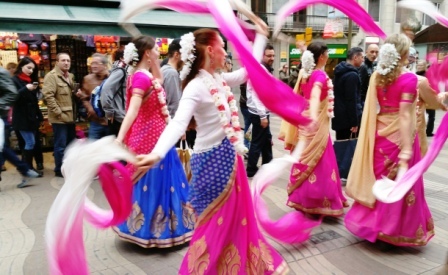 Barcelona’s vibrancy gets under your skin. It will beckon you back. Shopping. My trip souvenirs are usually edibles. 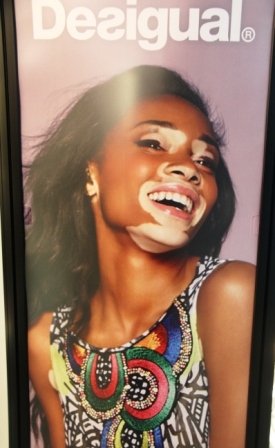 However, in Barcelona I could not resist Desigual, with vibrant, fun and colorful fashion. The popular Spanish clothing manufacturer was founded by a Swiss. There are shops throughout the city. Be On Guard. 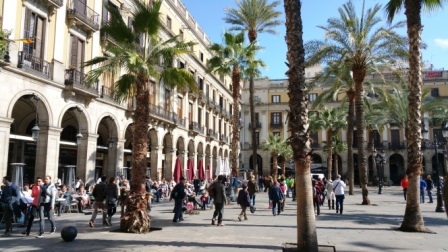 Theft, especially of tourists, is rampant in Barcelona. We were continually warned to be cautious and guard all belongings. We were and did. None in our group had any problems. museum and transport passes, on line ticket purchase and more. To avoid long waiting lines, buy tickets to popular attractions on line. 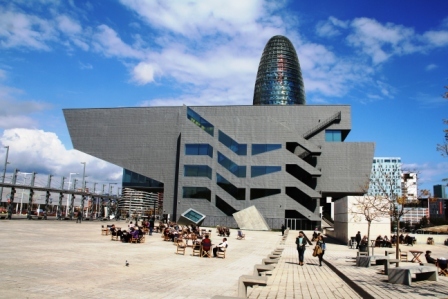 Pay a visit to the main office at Placa de Catalunya for more help and information. Take the Train.There is now service on France’ fast train, the TGV, from many towns in southern France to Barcelona. Aix-en Provence to Barcelona, 4 hours. Keep scrolling down for photos of more of Barcelona’s sights. Architect Frank Gehry’s fish at the seafront. 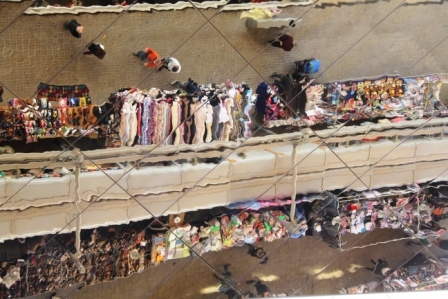 Barcelona’s flea market has moved and is now under a huge mirrored ceiling. 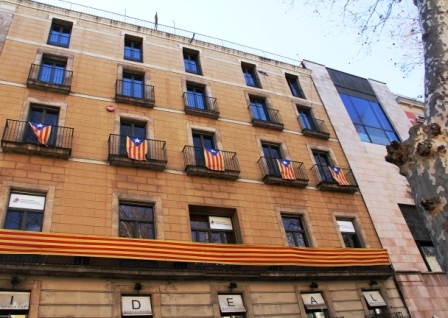 Catalans hope for independence and often display their flag. And thank you, Pat. 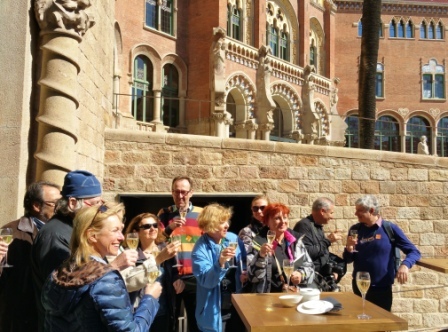 I am glad to know I brought back those memories of Barcelona and its treasures..
Ms. Leah….oh yes, you had many of the same reactions to this wonderful city we had–your blog reminds me of what I love about Barcelona. It was refreshing to hear someone else say the lines at La Sagrada Familia were off-putting; we also decided to put it off for another day. 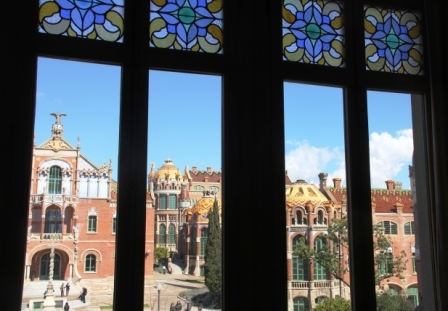 The Picasso Museum, the Casa Batilo, Palau de la Musica….ahhhh, how could these marvels have slipped away? thank you for reigniting my memories!! As always, you energize me and make me want to go, go, go. 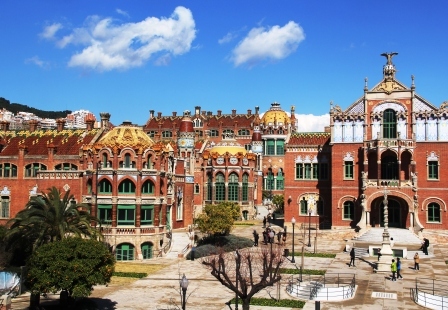 I visited Bercelona with Gloria about 5 years ago, in October (a great time of year), loved it, and want to return, for you’ve opened a few new doors for me, notably Sant Pau and Palau de la Musica which I don’t know. Oh, and what fabulous jamon iberico you brought back! Thank you, Lynne. I, too, want to return…. So many fabulous treasures to admire. I am glad the ham was good. Barcelona seems to be popular all the time. But October would be lovely, not so hot, and surely not as crowded as July and Aug. Come see us and we can go together. 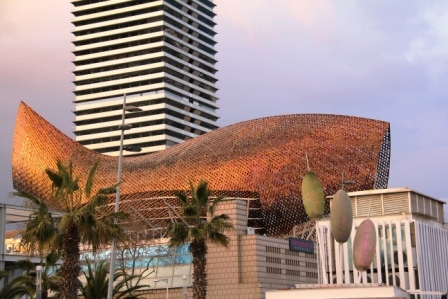 I can well understand why Barcelona would be on the list as an interesting city for Art and Architecture. Would October be a good time to visit without all the tourist ? Maravilloso–como siempre! Fantastic photos. What an amazing city…haven’t been there in decades…a bit has changed…definitely time for a repeat…and now I know the highlights–muchas gracias! Thanks Gayle. Yes, hop on the TGV and get to BCN. You won’t be disappointed. Nice post, Leah . . . I have long been fascinated by the Gaudi legacy, and the tragic way this brilliant loner met his end: struck down by a tram in the 1920s. It took some time for authorities to identify the body; he appeared to be just another anonymous, shabby vagrant. At least that’s what I recall having read years ago. That’s the story, Leonard. Yes, tragic. But his legacy is anything but, and every time I visit Barcelona I discover more. I definitely need to return to see the interior progress.on Sagrada Familia.